Climate change (what used to be called “global warming”) remains a controversial topic. There are the scientists who feel the evidence for climate change is overwhelming and does not merit further debate; however, there are other scientists who feel there are errors in gathering data (locating remote sensing devices too close to urban areas) and attempts to cover up and silence opponents of global warming ideology (see Climategate as an example of suppression of alternate opinions). John Broome does not enter into this particular debate. As a member of the International Panel on Climate Change (IPCC), he accepts the work as authoritative and spends his energy in sorting out the impact of this phenomenon on individuals and groups. Mr. Broome first deals with data. In chapter two, he summarizes the main arguments offered to support the idea that climate change is a serious problem. 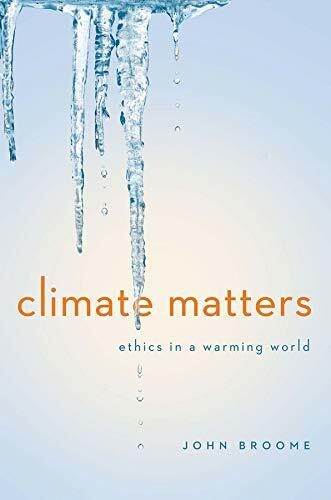 While he makes a number of specific statements about the details of climate change, there are very few references cited in the notes at the end of the book to support his claims (and no acknowledgement of opposing views). In this chapter, Mr. Broome paints almost a “worst-case” scenario of the consequences to the earth and its inhabitants if current trends continue. The philosophy throughout the book involves a redistribution of wealth and the assumption that the poor would be more responsible in their handling of natural resources than the rich have been. Here Mr. Broome argues for what he calls efficiency without sacrifice, in which those who are emitting harmful gases reduce their emissions sufficiently and are compensated. But he believes this is only an intermediate (and politically expedient) step toward the ultimate goal of efficiency with sacrifice, in which emitters reduce the harmful emissions, but do not receive compensation. His arguments are based on cost-benefit analyses, which he does not elaborate on. The next several chapters deal with issues of justice and morality. Mr. Broome makes a distinction with regard to these qualities between government and individuals. He does not give a clear definition of these parameters, but does say that “Goodness is a quantitative matter, and in the case of climate change it calls for complex calculations.” It appears that Mr. Broome subscribes to some form of a utilitarian philosophy. Throughout these chapters, he struggles with the issue of government coercion of the behavior of individuals. An entire chapter is devoted to the topic of uncertainty, certainly a valuable exploration given the number of problematic issues raised in this book. He explores questions of probability and raises some cautions about how we proceed in light of the uncertain consequences of our current choices. Many of the arguments in this book revolve around economic issues, which intuitively would not seem to be within the purview of a moral philosopher. Because Mr. Broome’s expertise in these areas is not established, his discussion needs to be evaluated very carefully by bringing in outside data and arguments and remaining always conscious of the philosophical and political agendas of those involved. The issues are complex, and the author brings a needed focus on the complicated debate before us.